Are those eggs inside the nest? Nice photo, and uncommon nest! 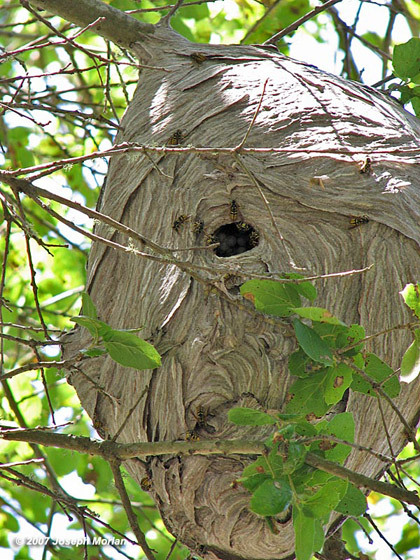 I'v never seen a nest of the aerial yellowjacket where the entrance hole is in the middle of the nest insted of the bottam, very unique. Those are probably closed ends of the cells where the larvae are pupating. Inside the paper nest are layers of hexagonal cells that look just like honeycombs, but made of chewed wood fiber. An egg is deposited in each cell. When it hatches the larva are fed by their older sisters till they pupate in that same cell. Those are not eggs, but "capped" cells. When ready to pupate, the larvae spin a silken dome over their cell. You are seeing the reflection of light off of those silken caps.